Is an upgrade from the iPhone 4S to iPhone 5 worth the money? Update: Check out our hands on: iPhone 5 review! Finally, the iPhone 5 has been announced by Apple. Sure, with this release the iPhone has trimmed up a bit - sporting a sleek new design built for the lovely new iOS 6 . But for iPhone 4S owners who got the iPhone 4s a year ago, is it really time for an upgrade? The iPhone 5 release date is Sept. 21 in the U.S. and U.K. and iPhone 5 pre-orders begin Sept. 14. What's more, iPhone 5 prices start at $199 with a contract in the US and £529 for an unlocked UK phone. Is the latest from Cupertino enough to seduce consumers into another new iPhone - or a two-year carrier contract extension? Let's start stacking up the stats. The iPhone 5 release date is Sept. 21 in the U.S. and U.K., and in much of the world. And, iPhone 5 pre-orders begin Sept. 14. The iPhone 4S made its debut almost one year ago, arriving on shelves Oct.14, 2011. Initially unveiled as the "Let's Talk iPhone" event led by acting CEO Tim Cook, the iPhone 4S announcement was also the introduction of Siri, Apple's voice recognition software for the iPhone. The iPhone 5 will be priced just like the iPhone 4S was: $199 for 16GB, $299 for 32GB and a 64GB model for $399, with two-year carrier contract in the US. In the UK, prices start at £529 for an unlocked phone. With the iPhone 5 on the horizon, the iPhone 4S received a price drop. The 16GB model will now sell for $99, or £449 for an unlocked UK phone. Not a bad investment, considering the 4S will be upgraded to iOS 6. When Apple previewed iOS 6 at WWDC, it teased a ton of new features to be ushered in with the iPhone 5. Now we've seen Passbook, which will keep track of your tickets and loyalty cards, and a new Maps app that will (finally) provide turn-by-turn navigation, and even 3D satellite imagery. Additionally, Apple showed a more detailed Calendar, and helpful tweaks like text message auto-reply when you're unable to take a call. The iPhone 4S is currently running iOS 5.1.1, But fear not, Apple has promised that devices as old the iPhone 3GS and the fourth Generation iPod touch will be updated to iOS 6. That means the iPhone 4S, the iPhone 4, the iPad 2 and the new iPad 3 won't be left out in the cold either. However, back when iOS 5 was released for older iDevices, many users experienced major slow downs and performance issues using the latest software on their older devices. Make sure to back up your iOS 5.1.1 on your device in iTunes before you update to iOS 6. The iPhone 5 will use the Apple's new A6 chip. While the exact speed of the processor is not yet reported, Apple rates it as twice as fast as the A5 found in the 4S. Apple expects this chip to do big things for gaming on the iPhone. EA Games Executive Producer Rob Murray was on hand to demonstrate Real Racing 3, a game he claimed had "console quality graphics." The iPhone 4S runs on the A5 chip, the same one found in the iPad 2, with a dual-core processor rated at 800 MHz. According to Apple, it offers graphics processing seven times that of the iPhone 4. When Apple initially unveiled it, Epic Games President Mike Capps was there to show off "Infinity Blade II." The exact amount of memory in the iPhone 5 is unknown, but it likely has 1024 MB, the same amount found in the iPad 3 and the latest smart phones like the upcoming Droid Razr HD. 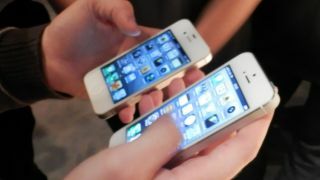 The iPhone 4S packs 512 MB of RAM, half that of recently released smart phones like the Samsung Galaxy SIII. The iPhone 5 has a 4-inch Retina display with 326 PPI, a resolution of 1136 x 640 and a 16:9 aspect ratio. A half-inch bigger than the 4S display, it'll use that extra space to a fifth row of app icons. The display on the iPhone 4S measures 3.5 inches (89 mm) diagonally. It runs at a resolution of 640×960 with 326 PPI. Like the iPhone 4S and its predecessors, the iPhone 5 comes in three storage sizes: 16GB, 32GB and 64GB. Before that, the iPhone 3GS was the last Apple phone to offer 8GBs of storage, which seems puny in retrospect. Finally, 4G for the iPhone is here. With the announcement of the iPhone 5 came the news that the iPhone would now support HSPA+, DC-HSDPA and LTE. That means 4G speeds on Sprint, Verizon and AT&T, as well as FaceTime over 3G networks. The iPhone 5 will also have improved Wi-Fi support, including 2.4ghz and 5ghz on 802.11n, with speeds up to 15MBps. The iPhone 4S is not 4G, of course, and we're still wondering if the revelation of FaceTime via cellular wil be retroactively applied to the 4S. Weighing in at 112 grams and with a thickness of only 7.6 mm, the iPhone 5 is 20% lighter and 18% thinner than its predecessor. The iPhone 4S was no beast itself, weighing 140 grams and coming in at 9.3 mm thick. Read more about the latest iPhone 5 announcements, updates and news.